Westerlund 2: A star cluster about 20,000 light years from Earth. 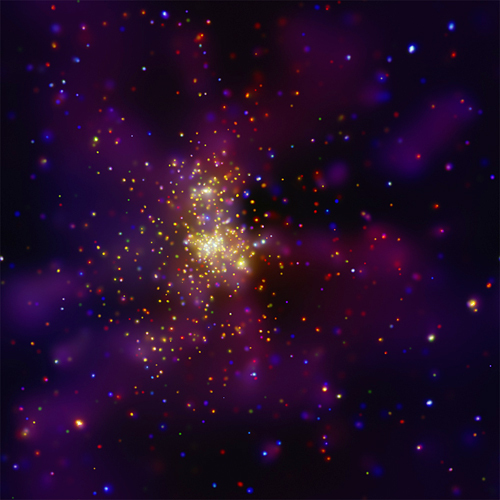 Caption: This Chandra X-ray Observatory image shows Westerlund 2, a young star cluster with an estimated age of about one or two million years that contains some of the hottest, brightest, and most massive stars known. In this image, low-energy X-rays are colored red, intermediate-energy X-rays in green, and high-energy X-rays in blue. The image shows a very high density of massive stars that are bright in X-rays, plus diffuse X-ray emission. An incredibly massive double star system called WR20a is visible as the bright yellow point just below and to the right of the cluster's center. Scale: Image is 8.4 arcmin across.